FORT MYERS, Fla. -- On Saturday of the staff trip to minor league spring training, Director of Scouting Ian Cundall and the rest of the SoxProspects contingent took in the High A and Low A games in Fort Myers against the Baltimore Orioles. Here are his Notes from the Field. 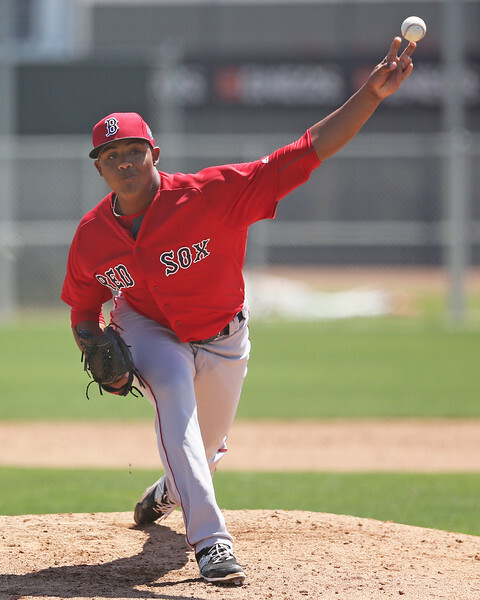 - The number eight prospect in the SoxProspects rankings, Nicaraguan right-hander Roniel Raudes, started for the High A squad. Raudes’ command was off in the first and he got punished for it, giving up four hits including a double and a triple. Raudes sat 88-90 mph, topping out at 91 mph, with the pitch showing some cut on occasion. He showed the ability to locate it at times, but when he missed up, it was very hittable. Raudes mixed in all of his secondaries, a short slider at 84-86 mph, changeup at 82-84 mph, and curveball at 74-76 mph. His curveball and changeup both flashed average-to-better during this outing, but his slider lagged behind. His feel for his curveball has improved since he entered the organization; he has solid feel for it and snaps it off well with long, 12-to-6 break. He also showed feel for his changeup, which showed late fade, throwing the pitch with deceptive arm speed. His slider had short break but lacked depth and was inconsistent. Raudes is the type of pitcher who must be judged as the sum of his parts, as he doesn’t have a carrying pitch and only tops out in the low-90s at best. None of his offerings project as plus, so he will have to rely on fastball command and his ability to keep hitters off balance by mixing pitches to succeed. Raudes has the ceiling of a back-end starter, but there is a fair amount of risk as he doesn’t have much margin for error and his stuff is unlikely to profile in a bullpen role. - Left-hander Darwinzon Hernandez started the Low A game, showing off intriguing raw stuff but also reinforcing that he has a long way to go developmentally. Hernandez has a sturdy pitcher’s frame with a strong, quick arm. He throws from a three-quarters slot, but has trouble repeating his delivery and finding a consistent release point. During this outing his arm tended to drag behind the rest of his delivery, and as a result he was consistently missing up to the arm side. Hernandez’s fastball sat 92-94 mph, topping out at 95 mph. The pitch has some life and he looks like he could have even more velocity in there as he matures. Hernandez’s secondary pitches are works in progress and were inconsistent during this outing. He threw his changeup 86-87 mph. The pitch was firm and he slowed his delivery when throwing it. At times, the pitch looked more like a two-seam fastball that he took something off of. Hernandez’s curveball showed better during this outing, but was also inconsistent. He threw the pitch 74-76 mph with 1-to-7 break. When he got over the pitch and snapped it off, it showed tight rotation and depth, but it was also loose and slurvy at times. Hernandez is an intriguing arm but has a lot of risk attached because of his poor command profile. He has shown the ability to miss bats, but questions remain whether or not he will throw enough strikes for that to matter. Full-season ball in Greenville will provide a good test for Hernandez, and if he can show he can handle the more advanced hitters and his stuff continues to develop, he could find himself inside the top 20 prospects in the system relatively quickly. - I wrote about right-hander Joan Martinez after I saw him on the first day of the trip, but he also threw the last day of the trip, and was much better in this outing. Martinez sat 94-96 mph and showed a sharper slider than in the previous look. He threw the pitch 82-83 mph compared to its prior 77-79 mph, and it showed two-plane break and tilt. He seemed more confident throwing the pitch in this outing and it showed bat-missing ability. 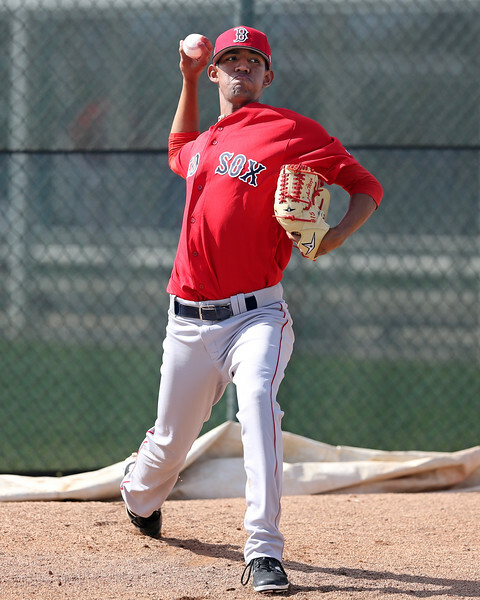 - 20-year-old right-hander Denyi Reyes has a strong, projectable pitcher’s frame. His raw stuff lags behind at present though, as his fastball sat 86-88 mph during his first outing against opposing hitters of the spring. Reyes mixed in two secondaries, a changeup in the low-80s and curveball in the low-70s. He showed more feel for the changeup and didn’t consistently snap off his curveball. - Right-hander Jose Gonzalez put up impressive numbers in the Dominican Summer League last year, but his stuff was very pedestrian during this look. Gonzalez has an average frame with some projection. He throws from a low three-quarters slot, starting on the third-base side of the rubber, and has a long arm action. His fastball sat 86-89 mph with late sink. The pitch was heavy, and when down in the zone could be effective, especially against right-handed hitters. Gonzalez also showed two off-speed pitches, a curveball at 70-73 mph and changeup at 80-83 mph. His curveball showed vertical break when he snapped it off, but his changeup was on the firm side. - 19-year-old center fielder Lorenzo Cedrola has some intriguing tools, but his upside is limited by his lack of physical projection. Cedrola is small, generously listed at 5-foot-11, 170 pounds. His frame doesn’t look like he can add much size and he has little-to-no power projection. He does, however, have plus speed and he showed it off in the games on Saturday, getting down the line in 4.2 seconds from the right side (60-grade) on a groundout to shortstop. Cedrola uses his speed to his advantage in center field, also showing good instincts and plenty of range over the week of games scouted. His arm is fringy though and profiles best in center field. Cedrola doesn’t have a high ceiling, but because of his contact skills, speed, and defensive profile, he has the potential to develop into a bench outfielder. 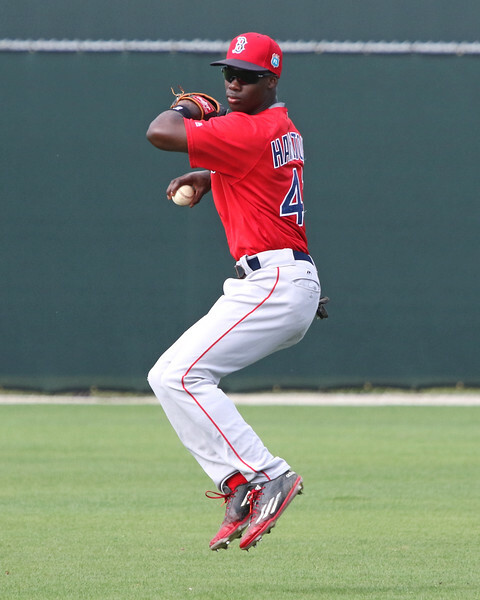 - After signing for $100,000 as a 2015 11th-round pick, outfielder Nick Hamilton has only appeared in 32 regular games and has really struggled at the plate, putting up a .143/.284/.187 in 91 at-bats, including 29 strikeouts in 49 at-bats in 2015. But on this day, Hamilton had a solid day at the plate, collecting a pair of hits and showing off the tool that intrigued the Red Sox—his speed. Hamilton didn’t start playing baseball until 2013 and was a running back and track star in high school before picking up baseball. He is still very raw at the plate and has poor pitch recognition skills, but if he can put the ball in play and get on base, he can cause havoc with his speed. Hamilton is an easy 70 runner—and perhaps an 80-grade runner based on the 6.37-second 60-yard run and 3.91-second time to first he recorded in high school—and showed it off on this day turning a groundball to left field into a double. If he can ever figure it out at the plate, Hamilton’s speed makes him interesting, but the odds of him making it out of the low minors are very low at this point.